One of the most valuable skills UX practitioners have is facilitating robust discussions so everyone’s on the same page. Unfortunately it’s not as simple as getting everyone in a room, letting them speak and walking away with a great outcome. Loud voices often dominate group discussions leaving the quieter group members feeling like they can’t contribute and their perspective isn’t valued. So how can we make sure our facilitation is valuable for everyone? 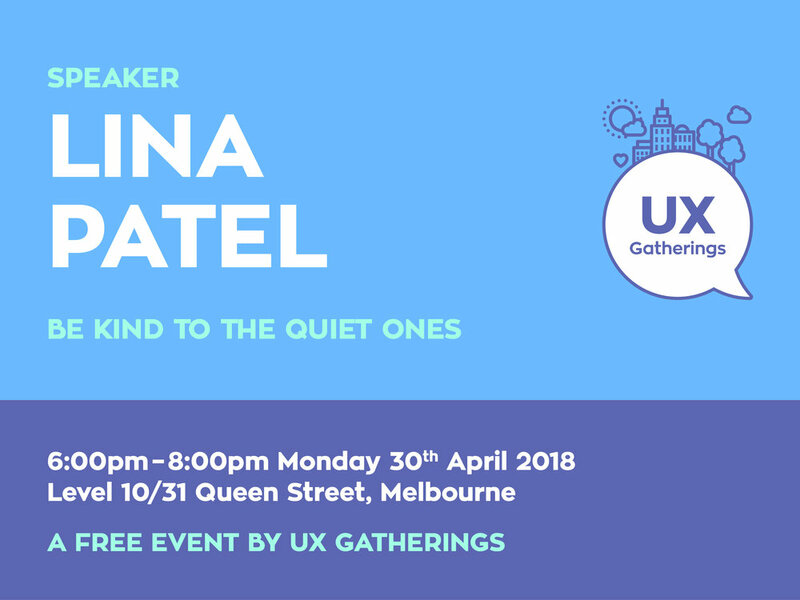 Lina Patel, Chief Operating Officer at Code for Australia, joins UX Gatherings to help take your facilitation skills to the next level. Lina will share how you purposefully facilitate a room with varying personalities, power dynamics and engagement levels making sure every voice is heard. You’ll be able to apply these techniques when you next facilitate and make sure everyone can contribute to the discussion. Lina is the Chief Operating Officer at Code for Australia where her unofficial title is ‘Getting Things Done’. Code for Australia brings together people from the public and private sectors to break down silos, work collaboratively and reanimate citizenship. As a professional facilitator, Lina is inclusive; outcomes oriented; and comfortable asking difficult questions compassionately, so that groups get to the heart of the matter. Lina facilitates the Centre for Sustainability Leadership’s ‘Future Makers Fellowship Program’ in Melbourne, a 6 month program designed to help leaders clarify their purpose and maximise their potential.